INDIANAPOLIS — Two suspects in the November 2017 murder of Indiana University Dr. Kevin Rodgers had pre-trial hearings Thursday. 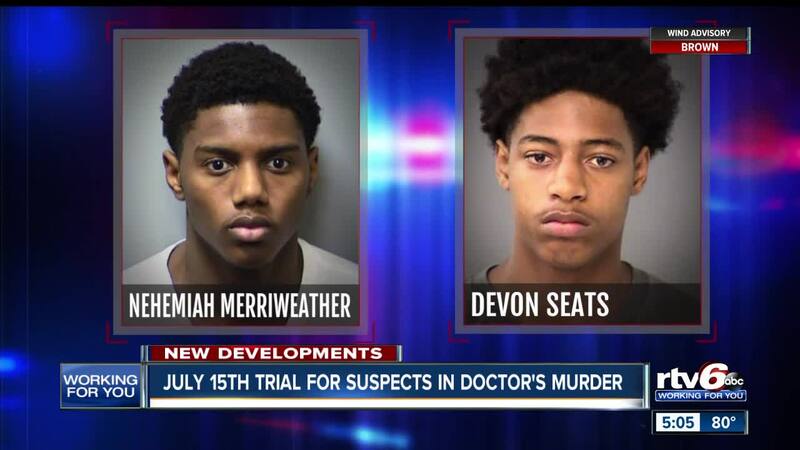 The cases of 19-year-old Nehemiah Merriweather and 18-year-old Devon Seats were merged and both are scheduled for trial together on July 15. The trial originally was scheduled to begin Monday. Rodgers, 61, was murdered at his northwest side Indianapolis home on Nov. 20, 2017. Investigators believe Merriweather, Seats, Tarius Blade and Ka'Ron Bickham-Hurst killed Rodgers when he encountered them while they were burglarizing his house in the 7500 block of Ballinshire South Drive. Blade and Bickham-Hurst previously pleaded guilty to lesser charges of burglary resulting in bodily injury. They will be sentenced after the Merriweather-Seats trial.